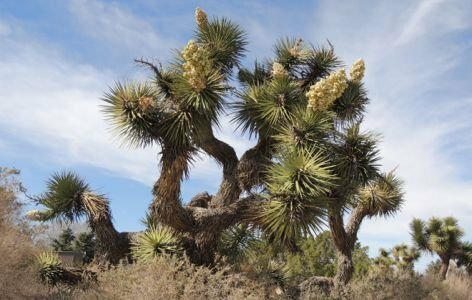 Yucca brevifolia, the Joshua Tree is one of the most well known, iconic plants of the southwest. 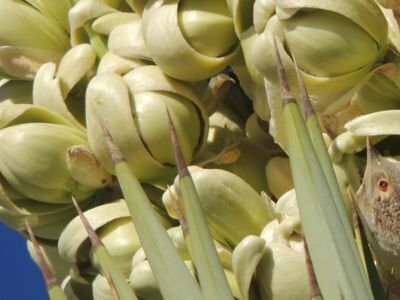 This article serves as an introduction to this fascinating and unusual plant. 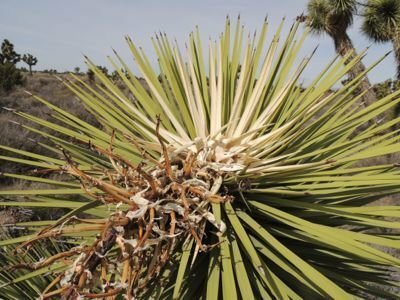 There are many dozens of Yucca species but few are as well known or recognized as the Joshua Tree, a large, branching, gangly plant that stands out in its native habitat where sometimes it seems nothing else of any size will grow. 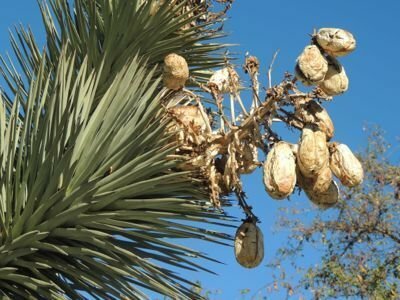 When I moved to my new home in the high desert of southern California I was amazed to see these growing right down the street from me, as I had always associated these with the ‘middle of nowhere'... so THAT's where I live now! 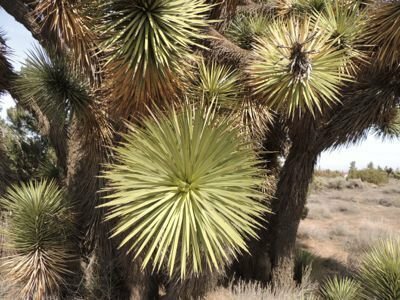 The Mojave Desert is a pretty harsh environment: hot in summer, cold in winter (snow is not uncommon in parts), windy throughout (often) and very dry. Not much variety can grow out there, though surprisingly the stretches I see are usually covered with vegetation (not a lot of exposed sand/dirt seen) as far as the eye can see... though most of it looks dead to me (and perhaps is). 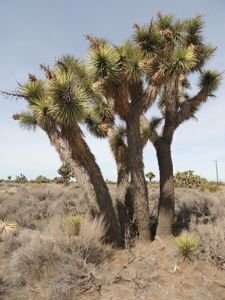 This is the home of the Joshua Tree, Yucca brevifolia. 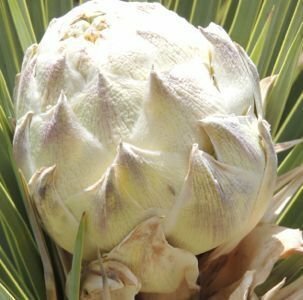 It is truly an odd plant, which is saying a lot for someone who's last twenty years of life has been heavily involved in the observing and growing of a lot of odd plants. 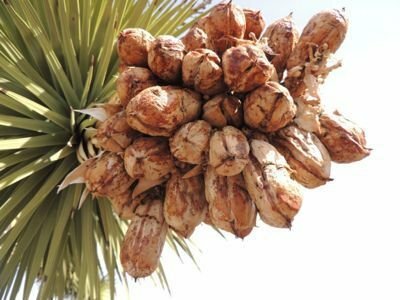 I even grew one of these in my more tropical climate of Los Angeles where these plants are not supposed to grow that well (soils too heavy and weather too wet). 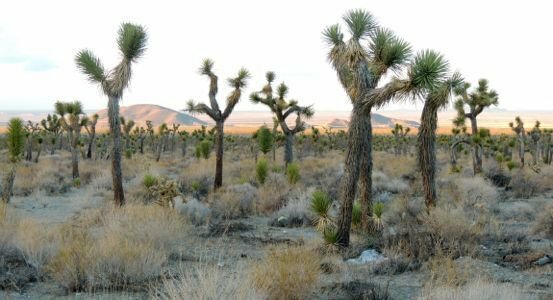 Hard to imagine my old home as a "tropical paradise" when it seemed more like the artic tundra compared to the ideal climates along the southern coast and more southern climates of southern California. 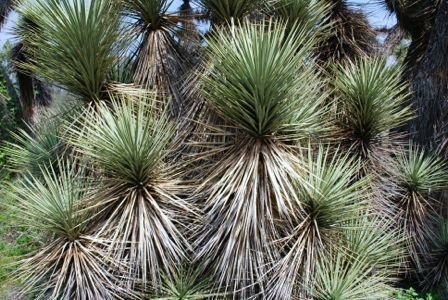 But compared to the home of this yucca, it sure was. 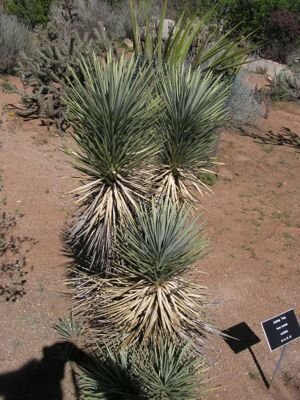 While many Yucca species will grow without any problem in heavier soils and constant warmth and regular watering, this plant seems much more finicky, wanting a yearly freeze (without it, it will not flower), very well-draining soils (often very nutrient poor, too), LOTS of sun and not a lot of water. 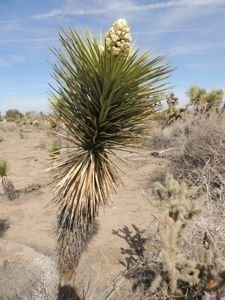 This year these plants are flowering in "abundance" in the Mojave Desert despite about 1-2 inches of rain in the last eighteen months...hardly enough to keep anything alive you'd think (and indeed, many of the native plants have long since croaked leaving a sea of grey in their wake). What would a year of flowering look like had there been a decent amount of rain, I wonder? 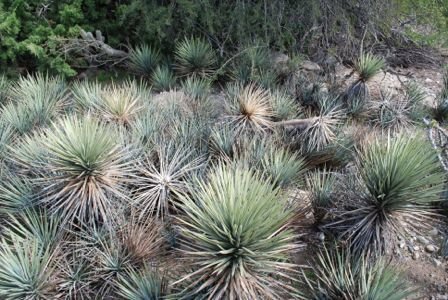 The leaves of this yucca are exceptionally stiff, even for a yucca, and about a foot in length (with quite a bit of variability depending upon the population and water availability- as short as six inches and as long as sixteen inches). 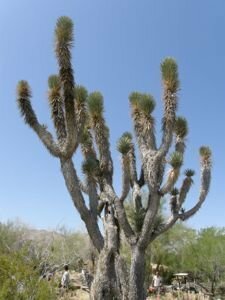 The leaves are narrow, rough to the touch and have very dinky, dull, closely spaced teeth along their edges. Leaf color varies from the typical pale green or light yellowish green, to a blue green color in more well-watered plants. 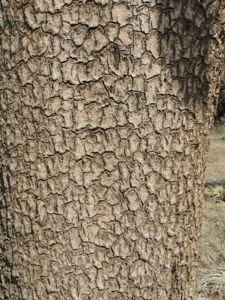 The trunks are woody and have fissured bark. Trunks can get up to several feet in diameter. Most of the trunk is covered with retained dead (or in well watered individuals, live) leaves. These trees, once having flowered, are branching, but so haphazardly it is hard to understand how some keep standing up. Most branching yucca species branch dichotomously (at the point of branching, two new branches form at the same time resulting in a bit of symmetry)... but supposedly this species does not necessarily branch this way... often just one branch will develop, often at an odd angle, or sometimes straight along the lines of the previous branch. 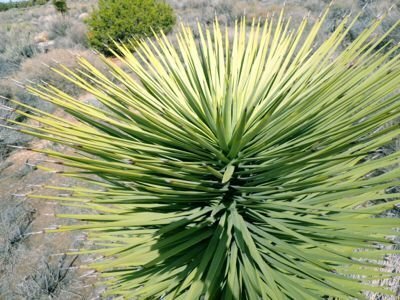 One Yucca brevifolia population does branch dichotomously and that may be what made taxonomists give it a subspecies name. 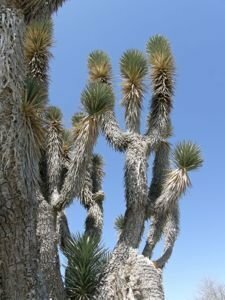 Well-watered trees seem to be more heavily branched and more compact in appearance with some getting really large (I have seen one or two maybe thirty feet tall, but they can get a lot taller from what I understand). Root systems are unsurprisingly extensive with roots spreading laterally for many yards. There are supposed to be some deep roots as well, but these are the more typical fibrous roots of all monocots and are not as thick. 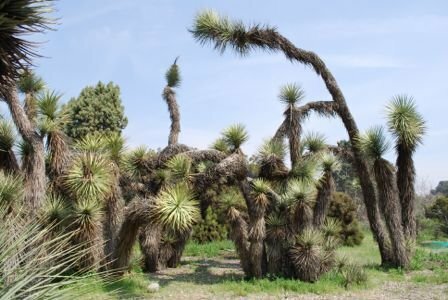 It is from the larger lateral roots that rhizomatous growth occurs, often resulting in a large dense ‘colonies' consisting of all the same plant (suckers, in other words). Flowers are white in densely compact inflorescences (more on flowers below). Leaves are straight as can be, and there are hundreds of them per rosette. Looking down into them is mesmerizing. Some plants, as in photo upper right, have much shorter leaves- possibly due to limited water . 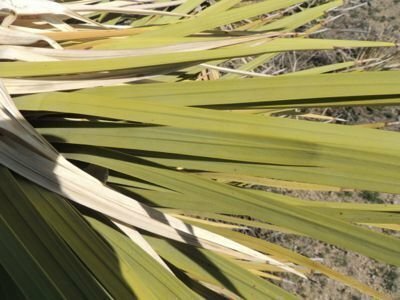 Notice lower right photo is of plant in public landscaping receiving an unsually high volume/ frequency of water and leaves are long, retained nearly the entire length of the trunk, and a more blue coloration. 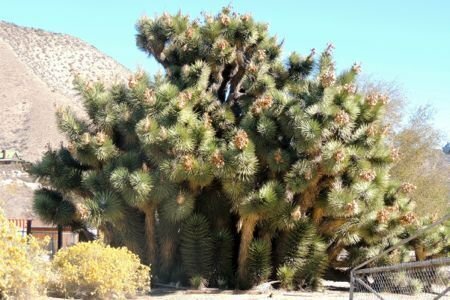 And some old, large plants have branching patterns that seem to be completely random and certainly not dichotomous (above) ; old tree on right is well over thirty feet tall and some branches can be found lying about it on the ground that obviously fell off at some point. Yucca brevifolia life typically starts out in the late winter to early spring as a small, flat black seed just under a centimeter in diameter, that just happens to get lucky enough to fall to the earth at just the right time and place to get enough moisture to germinate (sometimes having passed through the gastrointestinal tract of an animal that predates the fruits or seeds). 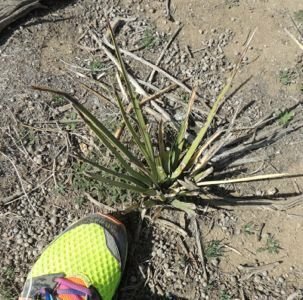 Then a tiny yucca emerges and grows that looks pretty much like a lot of other yuccas... very stiff, thin, sharp-ended pale green leaves shoot out of the ground to about eight inches tall. At this point the plant is already about a one in a million to have made it this far. But it still is quite vulnerable to being stomped on, driven over (if near civilization) and eaten by rabbits. 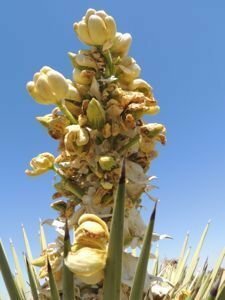 If you think rabbits will not eat a yucca, you have not seen desperate rabbits during a drought year. 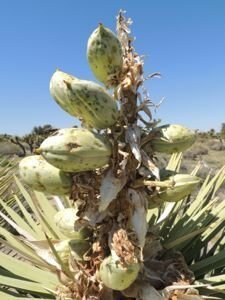 Then this plant starts to take on its unique growth shape one gets to see while driving the roads in the Mojave Desert (a huge desert spanning four states). 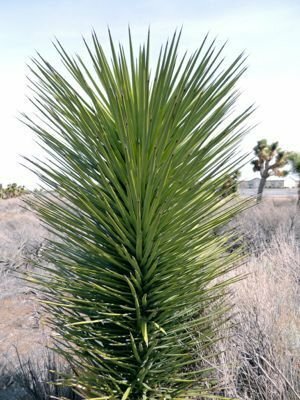 At first it grows as a solitary column of closely spaced, upright, pale green spikey, very stiff leaves (you do NOT want to fall into one of these accidentally- they will puncture you easily). At about 3 to 6 feet tall, they finally flower. From what I can tell, this is maybe 10 to 20 years after germination. 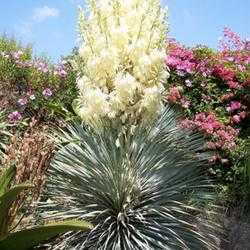 It is NOT a fast growing plant, even for a Yucca. It is not a plant you acquire as an old person (like me) hoping to see it branch someday. Planting this in your yard is for those that appreciate their appearance NOW or for your children or grandchildren to appreciate and admire decades later. all young plants growing as single columns, until they are old/large enough to flower. Then branching starts to take place. Flowering occurs in the mid- to late-winter, at least here in southern California. Not all trees flower every year. In fact, most do not. This year is a drought year and I would guess only one out of 20 or 30 trees has any flowers on it, but I have no idea how this compares to a year with a lot of rain. 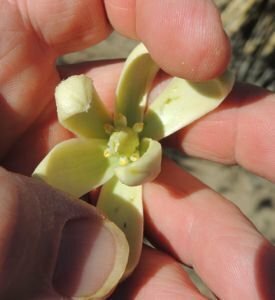 In trees that are flowering, sometimes just one out of twenty branches will have flowers, or as many as three out of five will. Rosettes that flowered last year of course are not going to be able to flower for at least, I would guess 2-3 years later, as a new rosette/branch has to grow to the point where it can at least support another flower. Last year I saw a few flowering in late February and decided I was going to get some photos of the event. But by the time it occurred to me again mid-March, the entire population was done and I didn't get any photos. These reportedly flower from February to April, but that probably depends a lot on where they are growing. So this year I didn't make that error again. The flowering event is a rather short experience, and not a terribly showy one at that. 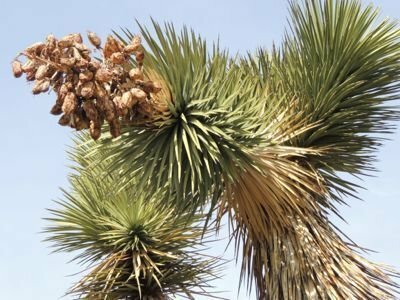 Unless you are looking to see them flower, or are exceptionally observant, I would hazard that about 99% of all people who drive by them along the Mojave highways will not notice the event. 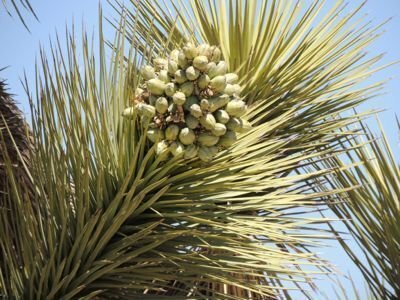 The flowers of Yucca brevifolia are among the least impressive and noticeable of all the Yuccas (a genus often known for their tall, impressive panicles of very showy flowers). 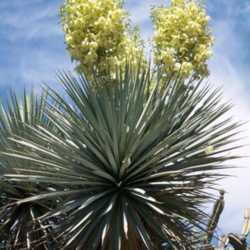 Flowers are white with a bit of very pale green and yellow in areas... but from a distance the flowering panicle looks like a little scoop of vanilla ice cream plopped on the top of yucca's branch end. 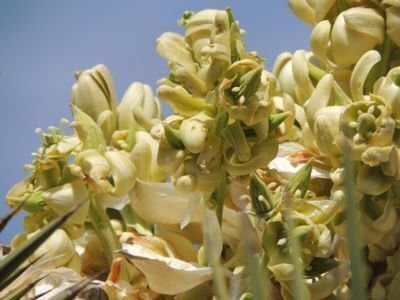 Up close, the flowers are in a tight clump with none of their sexual parts visible without pulling off the petals (or more accurately sepals or tepals). If one looks at a clump of flowers for a few minutes, one can see a lot of activity going on, with ants, little flies and tiny moths zipping in and out here and there. 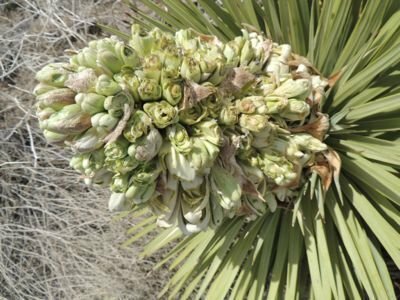 Some flower clumps have large chunks taken out of them which I assume is from some climbing rodent predation as there is little else in the Mojave that eats flowers at a height over a few feet (jack rabbits can only jump so high). 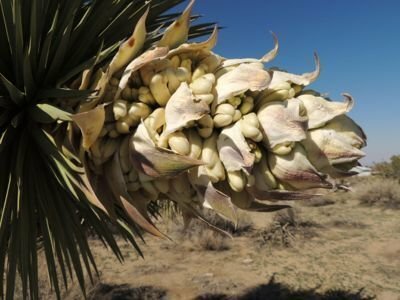 flowers open (as open as they get) on a plant in March, southern California's Mojave Desert left; young plant flowering for the first time (based on its perfectly straight columnar growth and lack of old flower skeletons) right. 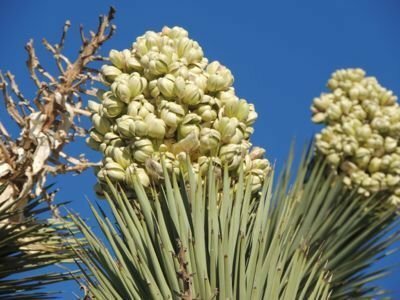 Close up of 'opened' flowers high up in a mature Joshua tree (left); right shows another panicle that suffered some pretty extensive predation- looks almost as if some deer did this, but this area has few if any deer. 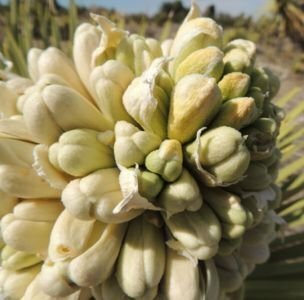 Soon after the flowering period, fruits begin to form at the base of the inflorescence. 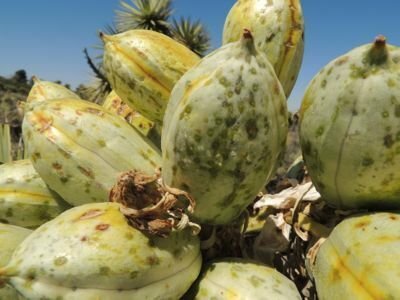 These fruits develop into ovoid, pale green miniature, grooved ‘melons' about twice the size of a pecan, and they slowly brown up over the summer until fall when they begin to break apart or fall off on their own (or the rodents finally find them all?). By mid fall to winter the only thing remaining of the flowering event is the skeleton, or flower stalk with a few little woody strands branching off in different directions. 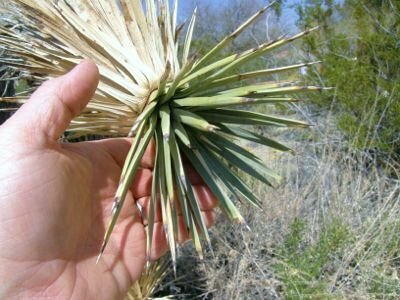 This skeletal structure is extremely strong and stiff- I could not break one easily nor were they easy to pull off the plant (I did not manage to break or pull off any no matter how hard I tried). There they remain and subsequent growth will pass them by eventually, and years later they can be seen mid branch. Eventually they turn black and become weaker and break off. From the point of the branch end being left with this floral skeleton to showing signs of regrowing is several years at least, and I have not been living around these plants long enough to see this happen yet. 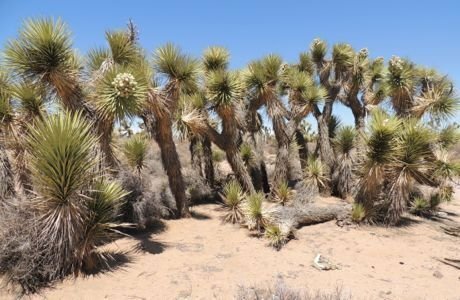 Yucca brevifolias are members of the monocot family Agavaceae, and though this genus is typically polycarpic, it has the ‘monocarpic growth pattern' of all members of this family. The term monocarpic typically means the plant dies after flowering. 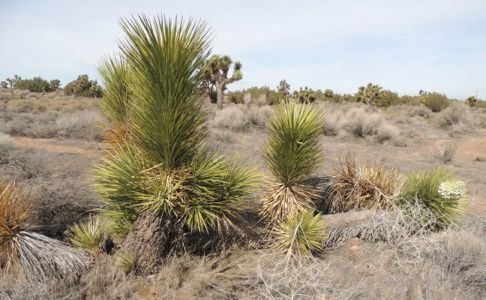 However, not all plants with monocarpic growth habits actually die. 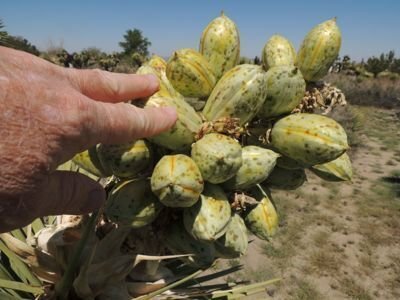 In a plant with a monocarpic growth habit, the bud or meristem at which point all growth takes place for that rosette or branch, stops growing and dies as soon as it flowers. For plants that only have that one rosette, that's the end of their life.... 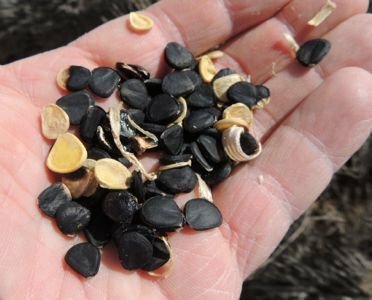 Many monocarpic plants live on by either producing a lot of seeds, or bulbils (miniature plants that form on the flower stalk), producing offsets from the roots before the main plants die, or from other branches in the few that branch. 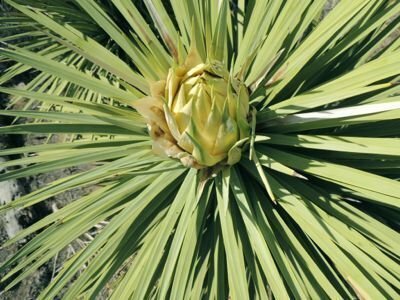 For most, if not all yuccas, their life continues on in the form of other rosettes or other branches. 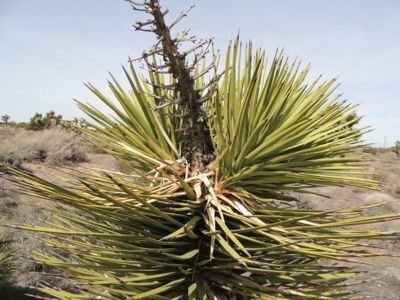 That is the main cause of a Yucca brevifolia to branch- as a result of a flowering episode (bud injury from insect damage or trauma are the other two). 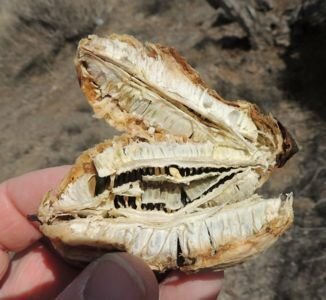 The growing point of the plant dies after it flowers and no more growth occurs from that meristem. 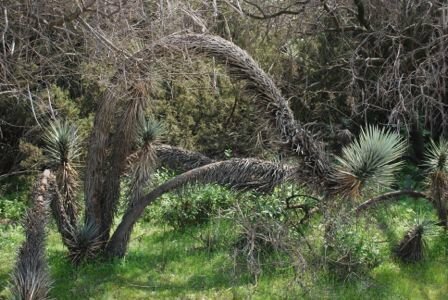 But new meristems are created and new growth starts over again in the form of new branches (in single stem Yuccas this new branch typically begins growing near the same spot where the last one died and with growth direction being the same, the end result is an apparently uninterrupted growth/trunk). So in several years following a flower, a new single branch (which will look more like simply a continuation of growth in the same direction, or sometimes with a subtle change in direction, or a pair of branches can be seen growing from the point of flowering (or just off to one side of it). Eventually, in maybe three to ten years, these branches will make flowers of their own, and more branching will take place. That is why old trees have so many branches. 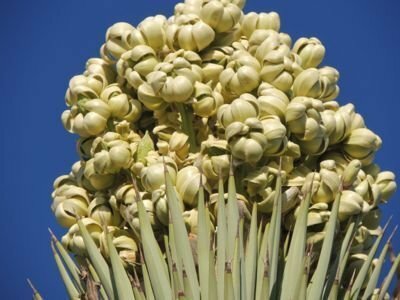 These gangly Yuccas branch almost erratically with new growths shooting out in nearly any direction (usually upward, but occasionally downward) and from almost any previous flowering point, even from ones that flowered years earlier. This growth pattern makes for a very erratic and often poorly designed end result, giving these clumsy looking trees a lopsided and asymmetric appearance which not only can make them look unbalanced, but often does to the point of causing the tree to fall over should there be any weak points in either their roots or trunk (gopher predation, wood boring insects etc.). 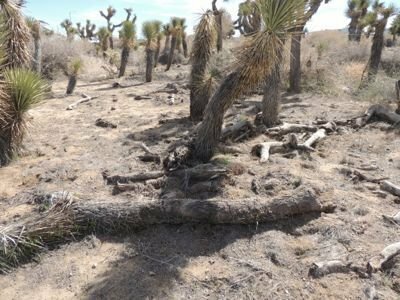 I notice that when I wander through a population of Yucca brevifolias many of them have fallen over (or were blown over- very high winds in these areas). Some of these, other than having fallen down, seem otherwise fairly healthy looking. 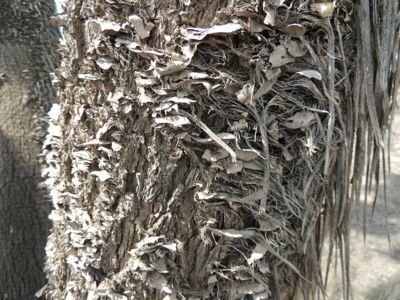 Continuing to grow after falling down is not unusual, and new growth can shoot up from nearly anywhere along the existing branches, and a new shaped colony will be born. Along with suckering from existing root stock, these fallen but living trees grow on sometimes into large, dense, tightly grouped colonies. These two fallen trees have been down long enough the new growth has begun forming and growing erectly, presumably from old flowering points (can't prove this, though) many many years earlier (at least a few scores ago in some cases, if not over 100 years or more). Not sure what activates this old meristem tissue to begin to grow a new branch again. Seems rather random. 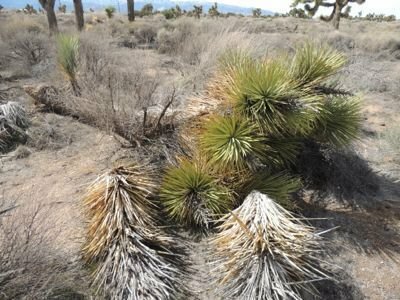 As one hikes about a colony of Yucca brevifolia, one cannot help but walk on or around a lot of corpses of older or fallen plants. 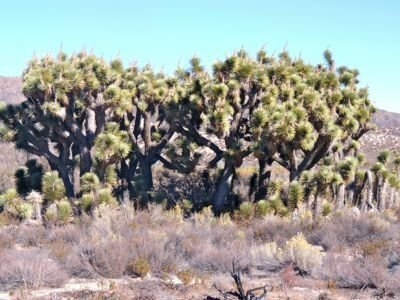 They say these plants can live up to a thousand years, with some historical plants having grown to about sixty feet tall in that time (never seen a plant anywhere near that tall). I think if it were not for drought years, there were be far less skeletal remains about. 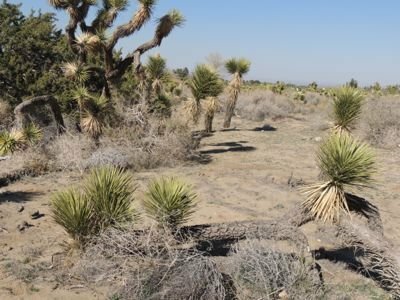 But drought can not only kill these plants outright (though they seem amazingly drought tolerant), but times of poor water availability put stresses on other creature that feed on these plants, that would have otherwise probably left them alone. 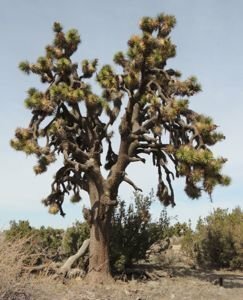 These skeletons are amazingly light and fibrous, making you realize how much water is in one of these living trees, which can weigh over a ton alive. 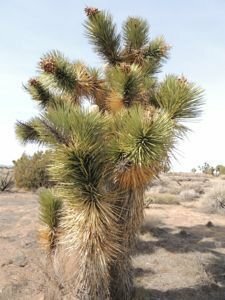 Driving through the Mojave Desert, one comes across populations of these trees that vary a lot in their members appearances. 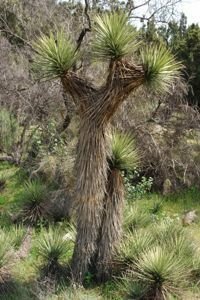 In some areas, only skinny, very wobbly looking or solitary branchless plants exists, showing a relatively young colony or one that lives on such minimal water that plants never attain any significant height or girth. 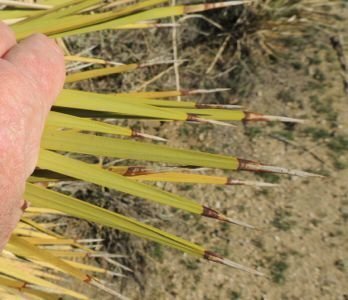 These plants all have relatively short needles, too. 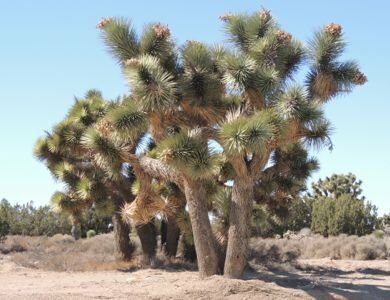 There is a subspecies of Yucca brevifolia alluded to above, called jaegeriana, which is known as the pygmy or dwarf Joshua tree, and is supposedly typified by shorter leaves and ‘truly dichotomous branching' resulting in somewhat more symmetrical looking trees. 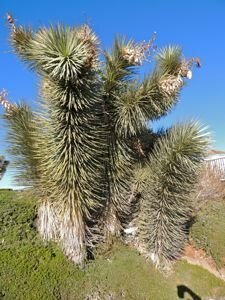 I am not clear exactly how to tell the difference as these can also grow very tall, and there is so much variability in the type species that a subspecies would have to look striking dissimilar for me to notice it. 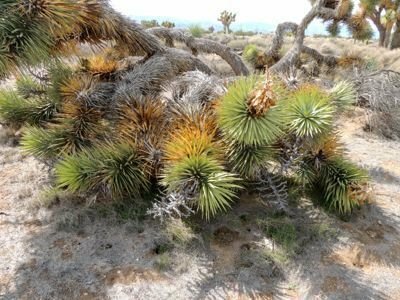 Still, I often wonder when I see these populations of dwarf, skinny Joshua Trees if I might be looking at some subspecies. 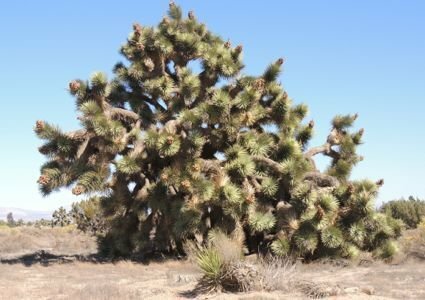 One also notices, while driving through areas where this tree grows, that there are definite populations of these, often separated by large areas where no trees occur, though I can see no reasons why. The edges of the colonies are rather abrupt, too... not showing the expected thinning density of a slowly expanding population, but almost like there was an invisible barrier they could not cross. In some areas, only a rare tree here or there can be seen for thousands of yards. 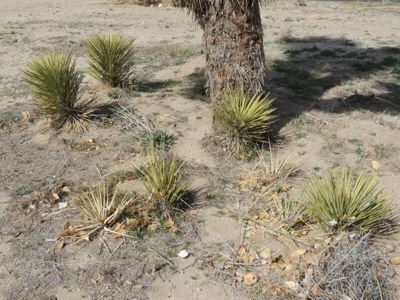 These isolated trees stand out quite strikingly in environments when the only other plants growing are far shorter, such as rabbit brush, creosote, cactus and other small, usually dead-looking plants. 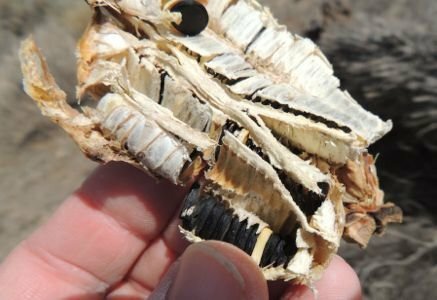 Perhaps these are the last remaining individuals in a location where maybe hundreds of years earlier they thrived. But due to climate change or human intervention of some sort, the populations disappeared. 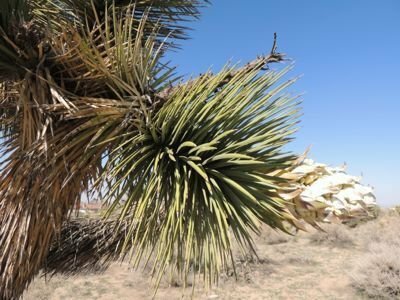 In other areas a lot of junipers are growing and these yucca trees don't stand out nearly as well. I have seen them growing along the edges of pine forests, too, where it snows regularly yearly. 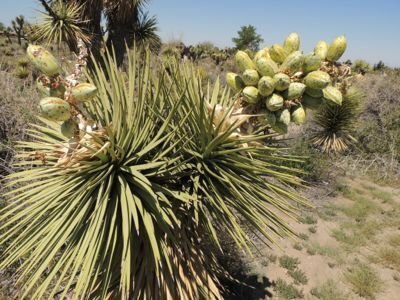 But I am at a loss to explain the large areas of desert or open mountain savannah that do not have any Joshua Trees in them, despite colonies growing on either side. It is either a sign of gradual spread... or gradual decline. Cynically I suppose the latter, but I have no idea really. 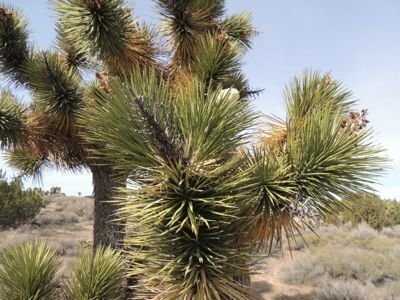 This tree is listed as endangered and that is one of the reasons I suspect the latter (though there are still obviously millions of these still growing, as there are many tens of thousands just in the small section of the Mojave I drive through regularly). Growing these in my climate is not too difficult, but acquiring one is a bit tougher. 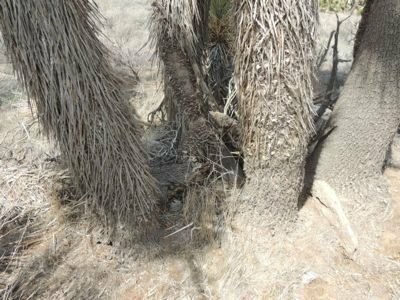 These are heavily protected trees with stiff fines for being caught digging one up. 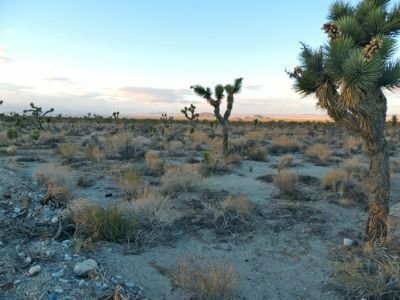 In some areas of its native range, housing developments are planned around some populations presumably because there are restrictions to how many can be dug up in the name of progress. I see many old plants in brand new yards so I am assuming these plants had been tagged as to be left alone during the development process. Some nurseries have made deals with the state and/or local government agencies and are allowed to dig up trees in areas to be developed, and to resell them. As a result, getting trees is not really hard if you know where to look, but it can be really expensive due to their limited availability and forced monopoly these few nurseries have to take advantage of. 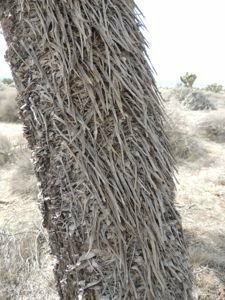 On top of being costly, these yuccas have delicate root systems (hard to believe after seeing so many fallen trees in desolate, harsh environments, re-growing from their root stocks) and moving larger trees has some poor survivability. And as I said before, they are a bit picky when it comes to soil type and overall environment. That is why I feel so lucky having one survive nearly 10 years in my crowded, overwatered and shady back yard... but time will tell if its transplantation to my new home will result in a living plant or not... so far so good (been over 6 months.. .but in terms of this plants potential life span, that may not mean it's going to survive... could be just a plant slow to die).